We have 330 consumer reports for treatment of Pain (joint) with Diclofenac. 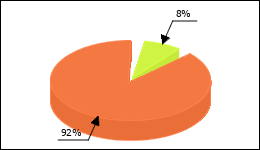 Pain (joint) used in 8% of cases. Get the diclofenac syringes for my rheumatic and joint pain. They help very well and already after 2 hours she starts to work. If you get the syringe from time to time, at most 3 in a row, the side effects are good to endure and not so bad. I get dizzy (but not always, depending on condition) with a bit of a headache. When I got the injections for 6 weeks, anxiety sets in, which disappeared after weaning after about 2 months. Due to severe shoulder pain doctor’s visit.Description of diclofenac 75, daily 2 tablets. After 2 days severe bleeding rectal.Short unconscious.On the 3rd day deposition of diclofenac and emergency hospitalization.Blood loss within 1.5 days about 3 liters.It was the highest mortal danger.Ca one week Intensivstation.Laut statement of the doctor treated it No chance of survival 2-3 hours later. 1. A very good drug, but unfortunately had shortness of breath. 2. Well tolerated only protection for me, easy hair loss, teeth loosen up after many years. 3. Central nervous system, is attacked, dizziness, tremors, stomach problems. 4.Good compatible.